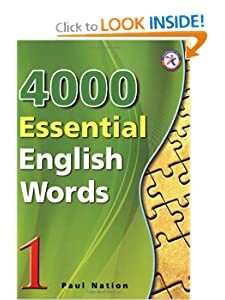 4000 Essential English Words is a six-book series that is designed to focus on practical high-frequency words to enhance the vocabulary of learners from high beginning to advance levels. The series presents a variety of words that cover a large percentage of the words that can be found in many spoken or written texts. Thus, after mastering these target words, learners will be able to fully understand vocabulary items when they encounter them in written and spoken form. Each unit presents 20 words which are defined and used in sample sentences. The activities in the books are designed to present the words in different uses so that learners can fully see how they can be utilized. Also at the end of each unit there is a story whch contains the unit's target words to give learners further examples of the words in use. Each level properly prepares the learner for the next which progressively challenges the learner with more sophisticated vocabulary and stories. Thank you for sharing this useful book. Seems interesting. Thanks for sharing Nanba. Valga Valamudan.